Last week, Sesame Street announced that it is introducing a new Muppet-style character with autism. I love this for many reasons, one of which is because they are making her a girl (named Julia). That’s a deviation from what would be expected, since autism is five times more common in boys than in girls. Creating this character as a girl challenges what people think they know about autism, and about who they think may be autistic among people they meet. I think many people, upon hearing the news, were under the impression that Julia would be seen on the popular PBS show we know and love. In fact, there are no current plans to put her on TV. 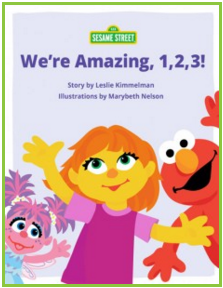 She’s only featured in one digital story book, called “We’re Amazing, 1, 2, 3!” If you were under the impression that Elmo was getting a new autistic friend in any recurring way, that’s still unclear. Although I wish we could anticipate more visibility for Julia, she’s still part of a great library of online resources designed to celebrate amazing qualities in all children. The most intriguing reaction to the news of Julia’s character that I found was an article in the New York Times, which suggests that unbeknownst to us, The Muppets already had an autistic character. If you know The Muppets at all, you definitely know this one. He can’t figure out what his audience will find funny, he often misunderstands metaphors, and even has a verbal tic (wokka wokka wokka). You guessed it… Fozzie Bear. Read the article, and more about the writer’s theory, here. When I read this column, it made so much sense to me. I’ve known lots of autistic kids that interact with others in a similar way as Fozzie. But the best part of all is that no one ever thought to label Fozzie as autistic. As part of The Muppets, he’s just another lovable character among many, all of whom have their own oddities. Fozzie may fit the diagnostic criteria of autism, but he’s not an autism character, or any kind of stereotype. He’s comedic without being a caricature. Autism acceptance is not simply passive tolerance. It’s not just about finding ways for kids with autism to learn, play and function alongside their peers. And it’s not just about teaching typically developing kids to understand their peers that have differences. At it’s best, and the goal, is to make it about allowing people with neurological diversity to be just people, and not be defined by what society deems to be a disability. I celebrate this new character of Julia. But at the same time, I just crave more Fozzie.